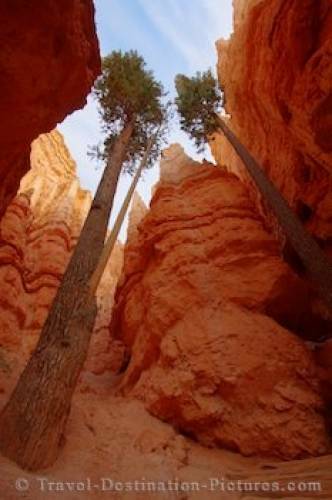 A pair of trees grow towards the sunlight in the Wall Street section of Bryce Canyon National Park in Utah, USA. A Lonesome tree is growing high to the light in the narrow canyons of the wall street section of the Queens Garden trail down in Bryce canyon NP. Bryce Canyon National Park in Utah, USA.